With over five years experience in providing equipment and services for clean rooms, we are constantly working hard to always meet the increasing needs of customers. To meet the demand of clean laundry from customers, we have developed a type of new services – Cleanroom Laundry services. 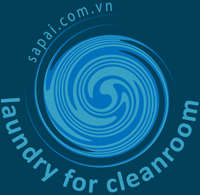 Cleanroom Laundry services for uniforms and other supplies used in bio manufacturing, film emulsion, medical devices, optics, pharmaceutical and semi-conductor industries are provided by Sapai Industrial Laundries in its Cleanroom Laundry facility. This state-of-the-art facility meets both ISO 14644 and IEST cleanroom operation standards. 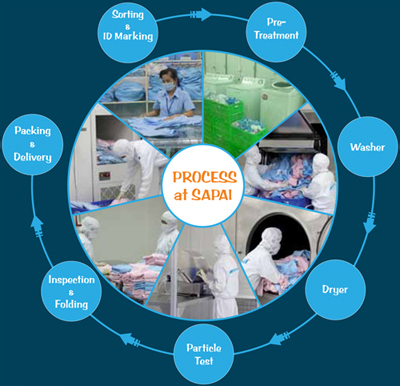 Sapai can process your uniforms and other items to meet specications of your cleanroom facility. Our cleanroom laundry service is 100% locally. From our daily pickups to emergency deliveries on weekends, Sapai is dedicated to provide the best possible service to our customers. We can make daily pickups and deliveries to your facilities. Once cleaned, we package and box the garments according to your specication. SAPAI owns a cleanroom laundry facility that specializes in cleaning, washing, and drying of Cleanroom uniforms and shoes. From pickup, to delivery, to washing, drying and packing, we ensure that each uniform is handled with precisely with care. Our Cleanroom laundry is maintained at 100 C for the most effective cleaning and service for our customers. Automatically dry the clean room shoes made of PP/PE/PS vamp and rubber sole after washing process. Our shoes dryer circulate the hot air heated by efficient electrical heater to vaporize the water content in shoes; while the high capacity refrigeration system condensates the vapor into water, accomplish the function of automatic drying cycle. Scanning incoming soiled garments and shoes. Soiled garments and shoes are inspected before being sorted into groups of similar items for washing, and damaged uniforms and shoes are weeded out for repair or replacement. Garments and shoes are loaded into large capacity (200 lb.) barrier pass-thru washers, washed with a solution of puried water and special non-ionic surfactants with Micro processor controlling to ensure the stable quality processing. Once sealed, the garments and shoes are placed in a pass-thru and sent out of the clean-room to the shipping area, which is itself often Class 100. Nitrile - Latex - Vinyl Class 100 gloves undergo a special cleaning procedure and are washed in DI water, dried and packed in a Class 100 cleanroom. The ultra pure water used in the cleanroom glove washing operation has gone through both a reverse-osmosis ltration and a mixed bed de-ionizer system (producing > 18 megaOhm water). This gives our gloves a very low particulate count and very low levels of ionic and organic extractables. The gloves are free from silicone, plasticizers and pigments.